There are plenty of home based business ideas out there. But if you’re looking for something that will let you exercise your creativity and work from home with supplies that are easily attainable, then a handmade business might be for you. Here are 50 handmade business ideas that you can do right from your own home. Design your own greeting cards from home using paper, stamps, stencils and your own artistic talents. Then sell your creations online. You can also design and create your own jewelry using beads and other supplies you can easily pick up online or at a local craft store. 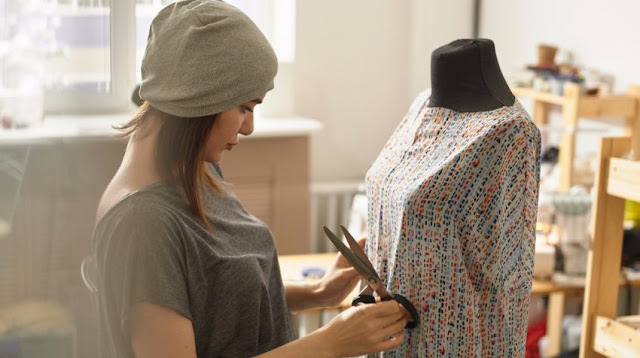 If sewing and making larger garments is more up your alley, then you can also create your own line of dresses or other clothing items to sell online. Even easier, you can sign up for an account with an online service like CafePress or Redbubble and upload designs that you can have printed on t-shirts and other products. Or you can get more creative and actually customize t-shirts with names or other items for specific customers. Candles are also popular products for people to purchase on sites like Etsy and Amazon. You can purchase some basic supplies and make your own scents and designs right from home. Likewise, you can mix a few basic ingredients, along with scents and other customizable materials, to make handmade soaps, lotions and other hygiene products. If you’re more visually inclined, you can start your own at-home painting studio and sell your original creations online. Or you could make a living selling illustrations to customers online. People will also pay for artwork that features calligraphy or other artistic lettering. Or you could even offer this as a custom service. For those who create any sort of visual art, from paintings to illustrations and more, you can also print out copies of your work to sell online at more reasonable prices. You can also offer custom artwork to online customers who want portraits drawn or painted of them or their families. For more tech savvy entrepreneurs, you can also offer a variety of different products that you design using your computer or other tech tools. Paper goods like invitations and notecards can also make for popular handmade products that people can purchase online. You can get really creative with different materials and styles by designing your own line of handmade bags and purses. Or you could make hats out of yarn, fleece, fabric or other materials. Scarves can also make for great handmade products to sell online. If you want to make a larger variety of products, you can create a line of hair accessories ranging from small pins to decorative headbands. Tie dye is a popular method of decorating anything from t-shirts to fabric shoes. You can experiment with different colors and patterns in your home or yard and then sell the products online. You can also customize a variety of different fabric based products by starting your own online embroidery business. Cross stitch is a similar artform to embroidery. But it can be a bit more involved. You can sell cross stitch hoops and other pieces of handmade art using this technique. If you’re more of a knitter, you can create a variety of different products to sell, ranging from scarves to large blankets. And you can do the same with crochet. Or you can make kids’ toys from fabric, stuffing and a variety of different materials that you can find at regular craft stores. Sculpting is another popular method of making handmade products. You can buy clay and other materials that don’t require a kiln or any other specialized equipment, so you can make your finished creations right from home. You can also start your own creative business as a photographer, taking pictures in a home studio or even your yard and then selling them online. Then you can also sell handmade frames that you create from plastic, wood or other materials. Or you can even have customers send you photos or artwork so that you can create a custom frame around it. Tech accessories like phone cases are in high demand right now. So you can purchase plain versions and then decorate them using various supplies. For more old-fashioned entrepreneurs, you can also start your own business by selling baskets online that you weaved by hand. Or you can start your own store that sells gift baskets with handmade baskets and other products inside. You can also sell products that people can use to make their own handmade items. With a few pieces of equipment and materials, you can spin your own yarn and then sell it to crafty customers online. Or you can use yarn, wool and other fibers to make woven wall art that you can sell as a finished product. If you’re interested in creating larger handmade products, you can make your own quilts with fabric, fiber and a sewing machine. For seasoned sewers and knitters, you can also create unique patterns that you can sell to other crafters online. If you want to help people preserve special memories, you can start a scrapbooking business where you offer patterns or even custom pages. Or you can design stencils and similar products that scrapbookers can use to make their own creations. Similarly, you can carve stamps out of rubber and sell them to scrapbookers or other creative minded customers. Or you could make beads out of clay, glass or a variety of other materials and sell them to jewelry makers. If you sell any kind of natural fiber or fabric products, you can dye them using items you may already have in your kitchen, like avocado skins and turmeric. If you want to sell books or journals, you can actually create your own covers and binding using basic materials from any craft store. Large wood products like furniture might be a little too involved for many home-based entrepreneurs. But you can carve smaller products like knick knacks out of wood with just a few supplies. You can also make your own candy products right in your own kitchen and then package them for sale. If you want to start a handmade business that’s more service oriented, you can offer to alter clothing and other items for customers who send their items right to your home. For more festive entrepreneurs, you can also design and craft your own custom holiday ornaments to sell during the season. If you want to make clothing but work with smaller pieces of fabric and other materials, you can make clothing to fit popular dolls and then sell those pieces online. Or you can make clothing and accessories made for dogs, cats and other pets. If you want to make a variety of different products, you can actually start your very own online gift shop with all of those different categories accounted for. For seasoned crafters, you can actually write your very own book with instructions or ideas and then publish it as an ebook online. Or you can create smaller craft related eguides and sell them on your website. For more in-depth instructions, you can make online courses dedicated to your craft of choice. Or you can start a blog about your handmade business and make money through ads, affiliate links or other methods.